February 5, 2019 is Safer Internet Day, an online holiday that was created to raise awareness of issues related to online safety. At SuperParent, we want to make sure you have access to the knowledge and resources you need to make informed technological and video game-related decisions for your family. In honor of Safer Internet Day, here’s a refresher on some of the ways you can keep your family safe online and control their experiences on Switch, PlayStation 4, and Xbox One. The Nintendo Switch offers tons of fun, family-friendly games for users of all ages. While some parental control features can be accessed on the console itself, the Nintendo Switch Parental Controls app on iOS and Android devices includes extra options. For instance, the app lets parents set time limits for how long, and how late, the Switch can be played each day. Want kids to be able to play for two hours (in total) on Saturday, but not past 8 p.m.? You can set both limits at the same time. When either time limit is reached, an alarm will pop up on the screen letting kids know it’s time to stop. Or, parents can have the Switch automatically suspend the current software when a time limit is reached, so there’s no arguing. Parents can choose from predefined age categories that match their kids’ ages, or create custom options for each child. The stock limits are designed to prevent little ones from playing games that are inappropriate for them based on their age. Parents can also “whitelist” games that they want younger users to be able to play. For a more in-depth look at the Switch’s parental control features, check out our guide. Sony’s PlayStation 4 allows parents to create separate accounts for each of their children, and set specific limits for each one. For instance, they can turn off a younger child’s access to the device’s internet browser, but allow an older child to use it. Like the Nintendo Switch, the PlayStation 4 also allows parents to set play time limits for each child, based on when and/or for how long they want their kids to be able to play games on the console each day. In addition, parents can restrict their children’s access to certain content, like games and Blu-ray discs, based on their age. They can also restrict their child’s access to network features (like being able to communicate with other users), add a monthly spending limit to their account, and more. For more information on the PlayStation 4’s parental control options, head to the PlayStation 4 support website. 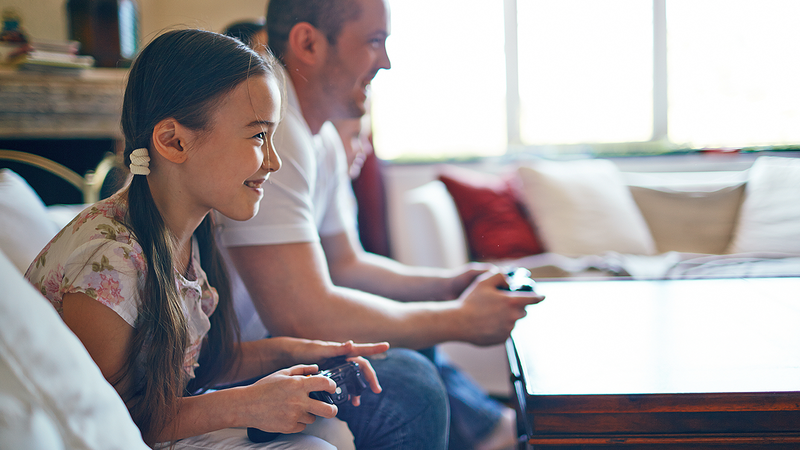 The Xbox One offers a nice set of parental control features, which allow parents to do everything from set screen time limits to activate content filters for their children. Parents can create separate accounts for each of their children, and then enable separate restrictions for each one. This includes the ability to set limits for when and for how long kids can use the Xbox One each day. Adults can also prevent kids from accessing games, movies, TV shows, and music based on their age rating, as well as choose the kinds of websites they want their kids to be able to access in the console’s Microsoft Edge web browsing app. Additional controls allow parents to prevent kids from purchasing new apps and games from the console’s store without their permission, limit the personal information other users can see, and select who is allowed to interact with their kids on the console. If there’s a Fortnite fan in the family, parents also have the option to prevent or allow cross-network gameplay and communication in the popular battle royale video game. You can learn more about the Xbox One’s family control features on Microsoft’s website. Keep checking back with SuperParent for more information on how to keep your kids safe online, and the tools available to help you do just that. While you’re here, here are some additional guides you might be interested in.